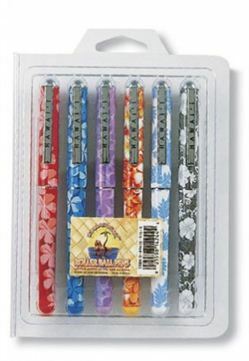 Our Flowers 6-Pack of Roller Gel Pens makes the perfect Hawaii souvenirs and gifts. Ideal for spreading some aloha to friends and family, this 6-pack makes sharing easy. Our gel pens have a fine point and write smoothly across the page. Each pen features a Hawaiiana design on the barrel and cap with "Hawaii" printed on the clip. Pen measures approximately 5-1/2" x 1/2"